Step into the battlefield while driving a cavalry of war, a tank, in Way of Tanks Game. Dodge bullets, speed up, overcome obstacles and deadly traps as much as you can. Destroy all enemies you see in your sight. Collect gold buckets and use it to upgrade and equip your tanks with more power-ups, ammo, and even buy a completely new one. This game is full fun, steel armor, clever maneuvers and adrenaline. Will you become a hero to your country and win the war? 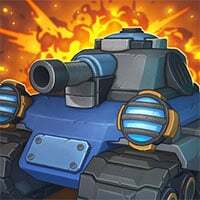 Enjoy and have fun in playing Way of Tanks Game. Good luck. This game is one of our Action Games at Round Games. This game is also tagged as a tank and war game. To play even more free games, view our most played and all games pages. If you want to play more games like this game: Then you can simply check out the games inside the game tags that are the most relevant to your interests or check the Action Games category or check the related games section at the end of the game page. Also make sure to check out DatTank.io Game, you may enjoy playing it.